First things first, do I know anyone here? Or does anyone here remember me? Bomberman Online is in my opinion the best Bomberman game in its franchise. Even the PCBMO failed in comparison. DC BMO is 3D cell-shaded with beautiful graphics and some really awesome game-play. The part that I loved the most about BMO was that it wasn't very technical at all. All you needed was a D-PAD (or Analog stick) and the A (sometimes B) button. So the true test of talent wasn't who knew the map the best or controlled the best power ups, it was who was smarter than the other. What most people don't know because they never played online, is that there was one map that was so much more fun than any of the other maps available in the game. The map I'm speaking of was called FULL FIRE and it only had one explode-able block in it (so as to get the Mr. Nakamoto Panel). If I remember correctly, FULL FIRE started everyone off with the same amount of bombs, skates and firepower. This way as soon as the 3-2-1 timer hit 0 the screen would erupt in a frenzy of explosions. I want to say it was something like 3 Bombs, 3 Skates and 4 Firepowers (Please correct me if I'm wrong). This was the best map in the game (online or offline) and the BMO Vets really enjoyed this map the most because it was 100% skill and 0% luck. The only map comparable to FULL FIRE is the offline map thats way too nuts to play on a competitive level (the one with the rainbow background, no blocks). I really wish to play this game online again just so I can play this FULL FIRE map again. Since the day this game was released, I was hooked to its online play. The lag was barely noticeable (except when playing against BR's) even on my 26k (sometimes 22k) dial up connection. My BMO Avatar was a Grey Elephant with the Mr.Nakamoto gundam type armor and the Ronin pants. I took a screenshot of my avatar with a digital camera during the victory celebration at the end of the match. To my knowledge, it is one of few surviving screen shots of actual online play. I have some videos somewhere, someplace, on some floppy discs that I may or may not ever look at again. I will upload the videos to youtube if I ever get around to installing a floppy drive and thumbing through my thousands of discs. I would like to also offer a quick shout out to my boys from BMO, the guys who used to play with me day and night, and helped me to become the self-proclaimed 6th Online Boss! My cheesy LoL! clan site is still up for any who care to look at it. It isnt nothing spectacular, but is still fun to look at for nostalgic purposes. PS. If you loved this game, or played online, please stop by the GameFaqs messageboard and say hi to the guys! wow, not everyday you run into a former DC BMO clan member. I almost feel like you should be put in a museum! Totally jealous of anyone who got to play this online. Quite simply you have to get those videos online share them with me or with the site owner here Lordnikon. There is no recorded footage of BMO being played in existance anywhere to my knowledge. Stuff like this is invaluable to the community So plese do provide them for us. I did take some Pics with a Dreameye camera. I cant find them all right now but I know (hope) Lordnikon still has them This is the only one I could find. hahahaha hey burt! Long time no see man! I must admit, its a breath of fresh air to see a familiar face around here. I wish I could speak to Hudson face to face, because I would say something like, "Man, Hudson, You used to be cool!" Oh well, I guess thats life. Have a good one dude, and share those videos! Blast I have all of your images archived. I can email them back to you in a zip file if you want them. lolJugalo, if you do have video footage of online play, it would be great if you could send me what you have. I have been compiling images and footage of the online process for any dc online game over the years, and am planning to release it all to the public in some form down the road to coincide with a project I have been working on for quite some time. There he is!! lolJugalo, Ridstar here I've had to recreate a new account because I forgot my old info. 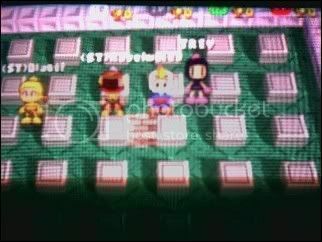 I am one of the lucky few to have the opportunity to play the best Bomberman known to date Online! I truly miss this game I've met so many cool people over the years of playing. The community for this game was just grand when the game servers were down and only the lobby servers were up and you have people just hanging out just have conversations about anything random that's something, mind you it was like this for a couple of weeks. @lordnikon - I promise you'll be the first person I send the videos to when I find them. The problem is that I have thousands of floppies and no floppy drive to read them! So I cant start the search until I get the proper hardware. But its been 10 years in a closet somewhere, they will still be there 10 years from now.